Zack Danger Brown of Columbus, Ohio wanted $10 to make some potato salad, so he went to Kickstarter. Now he has more than $2,000 to make potato salad, proving a long-standing theory here at Snacktaku — potato salad is pretty great. Update: My god. Thanks to his eloquent pitch ("Basically I'm just making potato salad. I haven't decided what kind yet.") and exposure on the likes of CNET, Zack Danger Brown now sits at the top of the potato salad heap, and he's not coming down for another 27 days. At that point, he'll probably need a moist towelette of some sort. 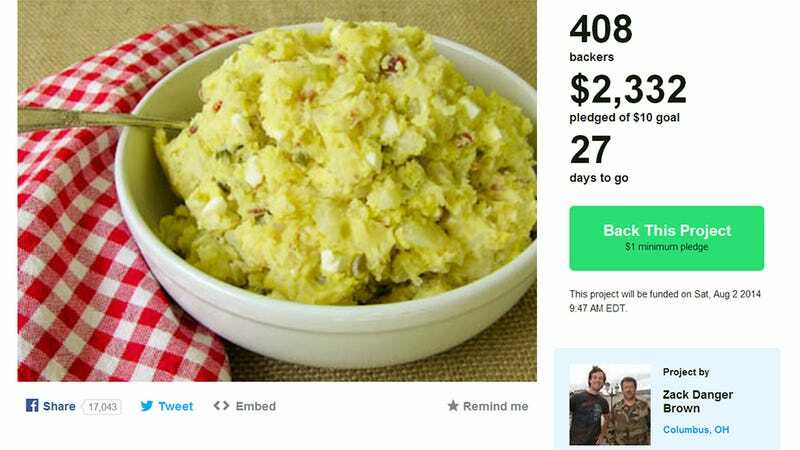 Kickstarter rewards include having your name spoken aloud as Zack makes his potato salad, potato salad hats, a chance to watch the potato salad being made and a bite of the end result, though how that'll be delivered is still up in the air. Thanks to stretch goals, Zack will be making several different kinds of potato salad, including traditional mayo-based, vinegar-based (perhaps German style with a little bacon) and a vegan option of some sort (whatever that means). Today is a day of triumph. We've Kickstarted games. We've Kickstarted technology. We've Kickstarted films. Now we've Kickstarted potato salad. Update: As of July 7 at 6 p.m. Eastern time, the Kickstarter has surpassed $15,000. If Zack isn't the head of the country's largest potato salad company by the end of this, I'll be sad.